Progressive rock band YES is on an ambitious tour of the United States, performing three classic albums in their entirety in a number of shows, including a stop tonight at the Warner Theatre in DC. In one concert, the band will perform their highly regarded albums, The Yes Album, Close to the Edge and Going for the One. 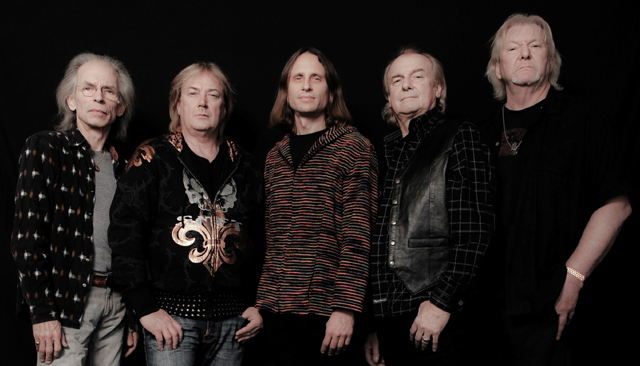 The band is hitting the road with much of its classic lineup, including bassist Chris Squire, guitarist Steve Howe, drummer Alan White, and keyboardist Geoff Downes. Joined by new singer Jon Davison, they have been selling out big shows in Los Angeles, New York and other major cities. I personally am excited to dive into the rich history of this band, which has declared they are still going to continue to make albums. Howe is one of the greatest living guitarists today; Downes is an innovator who also took his synths to The Buggles (beginning the band’s long and fruitful relationship with producer Trevor Horn). The influence of the progressive rock movement Yes helped to launch can be seen today in bands from Muse to LCD Soundsystem. Catch the show tonight and hear for yourself!